I was drawn to this familiar place – the Nolan House of the Presbyterian New England Congregational Church as seen from Whitney Place– on a day with the late afternoon shadows slowly creeping up the trunks of the trees. The trees were paired with each other and then paired with the building. 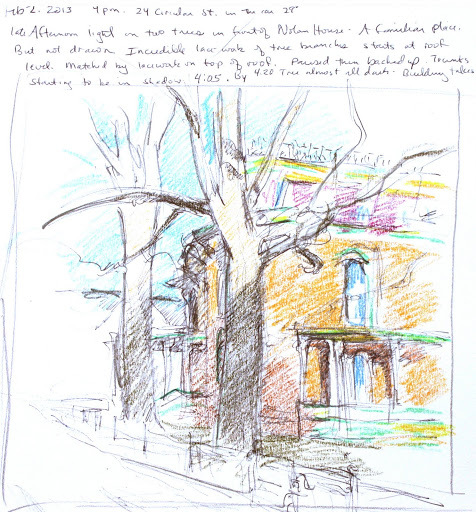 My notes indicate that the light on the trees only lasted 15 minutes – but I stayed and continued sketching the building as well. Trees in Saratoga have special relationships to the historical architecture that has embellishments that echo natural forms. Additionally,some buildings such as this one have filigrees of ironwork on the roof, a deliberate attempt to make a bridge to the sky in the way that tree branches do that naturally. Contact to comment or for purchase information.